^ a. Arabic became the sole official language in 1863. ^ b. Figures are taken from the Populstat.info website. Egypt was always a difficult province for the Ottoman Sultans to control, due in part to the continuing power and influence of the Mamluks, the Egyptian military caste who had ruled the country for centuries. 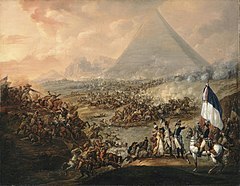 As such, Egypt remained semi-autonomous under the Mamluks until it was invaded by the French forces of Napoleon I in 1798. 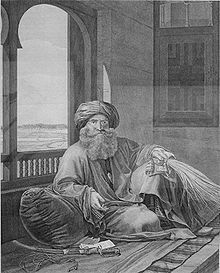 [dubious – discuss] After the French were expelled, power was seized in 1805 by Muhammad Ali Pasha, an Albanian military commander of the Ottoman army in Egypt. In 1609, something like civil war broke out between the army and the pasha, who had loyal regiments on his side and the Bedouins. The soldiers went so far as to choose a sultan, and to provisionally divide the regions of Cairo between them. They were defeated by the governor Kara Mehmed Pasha, who, on 5 February 1610, entered Cairo in triumph, executed the ringleaders, and banished others to Yemen, earning him the nickname Kul Kıran ("Slavebreaker"). Historians speak of this event as a second conquest of Egypt for the Ottomans. [by whom?] A great financial reform was then effected by Kara Mehmed Pasha, who readjusted the burdens imposed on the different communities of Egypt in accordance with their means. Murad Bey by Dutertre in Description de l'Egypte, 1809. The Revolt of Cairo, 21 October 1798, painting by Anne-Louis Girodet (1810). Sultan Mahmud II was also planning reforms borrowed from the West, and Muhammad Ali, who had had plenty of opportunity of observing the superiority of European methods of warfare, was determined to anticipate the sultan in the creation of a fleet and an army on European lines. Before the outbreak of the Greek War of Independence in 1821, he had already expended much time and energy in organizing a fleet and in training, under the supervision of French instructors, native officers and artificers. By 1823, he had succeeded in carrying out the reorganization of his army on European lines, the turbulent Turkish and Albanian elements being replaced by Sudanese and fellahin. The effectiveness of the new force was demonstrated in the suppression of an 1823 revolt of the Albanians in Cairo by six disciplined Sudanese regiments; after which Mehemet Ali was no more troubled with military mutinies. 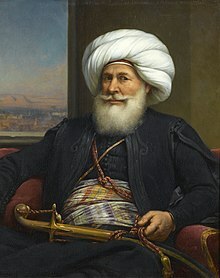 The pasha was much under French influence, and in 1854 was induced to grant to the French engineer Ferdinand de Lesseps a concession for the construction of the Suez Canal. 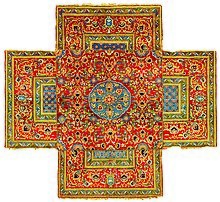 In January 1863 Said Pasha died and was succeeded by his nephew Ismail, a son of Ibrahim Pasha. ^ Holes, Clive (2004). Modern Arabic: Structures, Functions, and Varieties. Georgetown Classics in Arabic Language and Linguistics (2nd ed.). Washington, D.C.: Georgetown University Press. p. 43. ISBN 978-1-58901-022-2. OCLC 54677538. Retrieved 9 July 2010. ^ Faroqhi, Saraiya (2008). The Ottoman Empire: A Short History. Shelley Frisch, translator. Princeton, New Jersey: Markus Wiener Publishers. p. 60. ISBN 978-1-55876-449-1. OCLC 180880761. ^ Full text of the Treaty of Lausanne (1923): Article 17 of the treaty refers to Egypt and Sudan. ^ D. E. Pitcher (1972). An Historical Geography of the Ottoman Empire: From Earliest Times to the End of the Sixteenth Century. Brill Archive. p. 105. Retrieved 2 June 2013. ^ a b c d e f g h i j k l m n o p q r s t u v w x y z aa ab ac ad ae af ag ah ai aj ak al am an ao ap aq ar as at au av aw ax ay az ba bb bc bd be bf One or more of the preceding sentences incorporates text from a publication now in the public domain: Chisholm, Hugh, ed. (1911). "Egypt § History" . Encyclopædia Britannica. 9 (11th ed.). Cambridge University Press. pp. 92–127. ^ Holt, P. M.; Gray, Richard (1975). Fage, J.D. ; Oliver, Roland (eds.). "Egypt, the Funj and Darfur". The Cambridge History of Africa. London, New York, Melbourne: Cambridge University Press. IV: 14–57. doi:10.1017/CHOL9780521204132.003. ISBN 9781139054584. ^ Hans Ferdinand Helmolt (1903). The World's History: Western Asia. Africa. W. Heinemann. p. 712. ^ Jean Batou (1991). Between Development and Underdevelopment: The Precocious Attempts at Industrialization of the Periphery, 1800–1870. Librairie Droz. p. 181. ISBN 9782600042932. ^ a b c Jean Batou (1991). Between Development and Underdevelopment: The Precocious Attempts at Industrialization of the Periphery, 1800–1870. Librairie Droz. pp. 193–196. ISBN 9782600042932. ^ a b E. H. M. Clifford, "The British Somaliland-Ethiopia Boundary", Geographical Journal, 87 (1936), p. 289. ^ a b I.M. Lewis, A Modern History of the Somali, fourth edition (Oxford: James Currey, 2002), p. 43 & 49. ^ a b Jane Hathaway (4 April 2002). 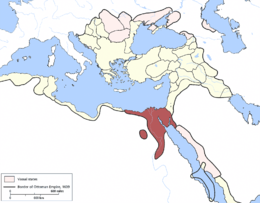 The Politics of Households in Ottoman Egypt: The Rise of the Qazdaglis. Cambridge University Press. p. 9. ISBN 978-0-521-89294-0. Retrieved 10 June 2013. ^ M. W. Daly; Carl Forbes Petry (10 December 1998). The Cambridge History of Egypt. Cambridge University Press. p. 10. ISBN 978-0-521-47211-1. Retrieved 10 June 2013. ^ Michael Winter (1992). Egyptian Society Under Ottoman Rule: 1517-1798. Routledge. p. 20. ISBN 978-0-415-02403-7. Retrieved 10 June 2013. ^ P'Ojok, Akena (15 January 2011). "A Chronicle of The New African State of South Sudan". Gurtong.net. Retrieved 22 January 2015. ^ Moore-Harell, Alice (April 1998). "Slave Trade in the Sudan in the Nineteenth Century and Its Suppression in the Years 1877–80". Middle Eastern Studies. 34 (2): 113–128. JSTOR 4283940. ^ Güzel, Hasan Celal (8 January 2013). "Batı Sömürgeciliğinden Türk Dostluğuna: Afrika" (in Turkish). Sabah. Retrieved 22 January 2015. Lane, Edward William (1837). An account of the manners and customs of the modern Egyptians: written in Egypt during the years 1833, −34, and −35, partly from notes made during a former visit to that country in the years 1825, −26, −27, and −28. 1. C. Knight and Co. Retrieved 6 July 2011. This page is based on the Wikipedia article Egypt Eyalet; it is used under the Creative Commons Attribution-ShareAlike 3.0 Unported License (CC-BY-SA). You may redistribute it, verbatim or modified, providing that you comply with the terms of the CC-BY-SA.